作者: Kuban Abdymen on 8 February , 2019. 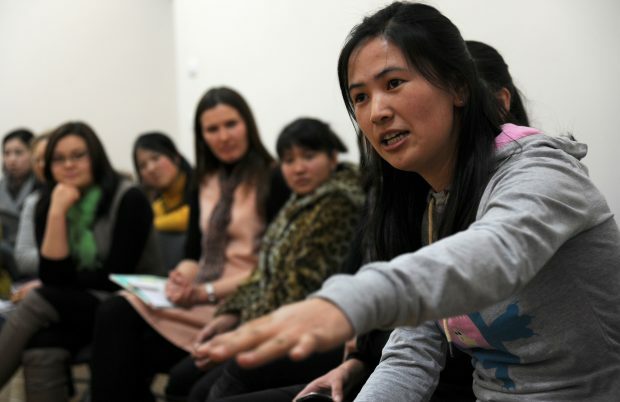 Since gaining independence in 1991, the Kyrgyz Republic has been gradually changing its former Soviet-style educational system, with the authorities paying great attention to improving its effectiveness. They keep an open mind to implementing new and successful approaches of educational systems in other countries, both in primary and secondary schools, as well as universities and other academic institutions. There are more than 2,000 schools in the country, with over 1 million students. All schools have 11 years of study. However, after graduating from the 9th grade, students can transfer to vocational schools, in which they receive additional education and pursue a specialty. This allows them to get a job in their chosen specialty. More than 60 percent of the schools are located in rural areas. A problem they face is that there are often not enough teachers in some subjects. Therefore, it is not uncommon for students to move to schools in cities, including the capital, Bishkek. Schools in the cities provide more advanced coursed and their graduates can enroll not only in local higher educational institutions, but also in foreign ones. Kids can start attending a regular school from the age of 7. At the same time. a new trend is emerging: private schools which allow kids to start studying from the age of 4 or 5. In addition, these schools conduct preliminary tests to determine the abilities of prospective students and decide whether they can be accepted. If the conditions and qualifications of a school satisfy the parents, and, most importantly, if it has a good reputation, they send off their children to that school. For instance, the Sebat educational institution, which was founded by Turkish mentors associated with the Turkish independent educational system, is successfully operating in the country. Despite the fact that in order to educate a child in the schools of this system, it is necessary to pay a decent amount of money, there are more and more people willing to do so. There are 16 comprehensive schools throughout the country and their pupils and graduates are becoming winners of various competitions among schools on local and even international levels. This means that they receive recognition not only from the official authorities, but also from the majority of Kyrgyz society. Moreover, other private educational institutions are being set up in the country, such as the Cambridge School and the Oxford School in Bishkek. There, teaching and instructions are mainly conducted in English, with emphasis on the introduction of new educational methods. Their popularity is also growing, although studying there is more expensive. Higher education in the Kyrgyz Republic is also gradually changing. All universities have moved to what is known as a two-stage education. At the first stage, students study for four years and receive a Bachelor’s degree. Then those who wish to continue studying in a specific discipline have to study for two additional years and offer a master’s thesis to obtain a Master of Arts degree.